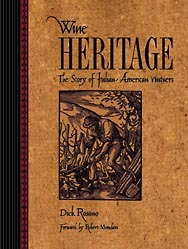 of Italian-American Vintners, published by the Wine Appreciation Guild (800-242-9462). Drive down the wine roads of California and you may think you've slipped onto a movie set from La Dolce Vita. The Italian names that adorn the winery signs throughout America's western regions lend a melodic quality to the tour guides' narrative and stand as a constant reminder of the contribution of Italian-Americans in the growth of what is now an internationally renowned American wine industry. < But the Mondavis, Gallos, Coppolas, Pedroncellis, Pepis, Sebastianis and Martinis didn't just appear on the scene when the rest of America discovered wine in the 1970s. As early as 1766, Dr. Andrew Turnbull brought Italian vintners to Florida to establish a wine industry there. Even Thomas Jefferson's winemaking plans depended on the help of Filippo Mazzei, a Tuscan whose winemaking skills convinced Jefferson of the viticultural possibilities in his beloved Virginia. The real impact was felt, though, when the good fortune of the New World coincided with the bad fortune of the Old World. Just as America's Gold Rush was drawing settlers to the West Coast, Italy's economic and political problems were making life difficult - if not impossible - for millions of its citizens, particularly in the south. The Great Migration began in the 1870s, reaching historic proportions from 1880 to 1920 as many of the Italian emigrés landed on American shores, only to pass through its eastern portals to the rich agricultural land on the West Coast, where they discovered green rolling hills and fertile fields. Some of the most famous names in American wine got their start during the four decades leading up to Prohibition in 1919. Seghesio, Simi, Sebastiani, and Foppiano all started in the late 1800s and are still operating today. Giuseppe Magliavacca's Napa winery was by then a thriving business, Secondo Guasti had established the Italian Vineyard Company, and Andrea Sbarbaro had founded Italian Swiss Colony. Countless other wineries appeared with Italian names on the door. By 1920, the Italian influence had already permeated the California wine scene. Then Prohibition hit. From 1919 to 1933 (Prohibition to Repeal), Italian-Americans in California kept their vines in the ground, waiting for the day when their adopted country would come to its senses. They were rewarded by Repeal but, more importantly, the families that had struggled to maintain their vineyards gave America a jump start when it tried to emerge from the dark days of Prohibition. Without the vineyards and the fully equipped - though idle - wineries, America would have had to rebuild the industry from scratch, an industry that is synonymous with longevity and tradition. Today's California wine scene is still dotted with Italian names. The Trinchero family name is hidden behind its non-Italian winery name: Sutter Home, despite its monumental success. Robert Mondavi has done more for American wine than perhaps any other person. Then there's Ferrari-Carano, Geyser Peak (owned by the Trione family), Viansa, Cosentino, Atlas Peak (Antinori), Dalla Valle, Delicato, Valley of the Moon, Parducci, Signorello, Sattui, Rochioli, Rafanelli, Mazzocco, and dozens more. It's hard to imagine where our wine industry would be today without the Italian immigrants and Italian-Americans who built it up in the 19th Century, supported it during Prohibition, then led the effort to make American wine the world leader that it is today.